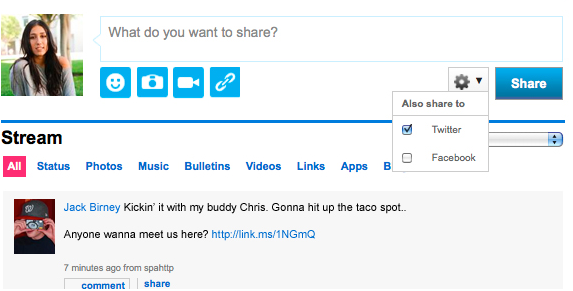 MySpace has finally Sync and Plugin with their rival Facebook to compete with other social networking websites. Facebook has grown so dominant that not syncing up to its web of social connections would be a mistake. The News Corp.-owned social network, as was rumored late last year, has "synced" its service with Facebook (and Twitter) so that members can cross-post their status updates as well as shared content. It's pretty self-explanatory, taking the recently revamped "stream" design of MySpace profiles and plugging in Twitter and Facebook's application program interfaces (APIs). The "syncing" applies not only to individual MySpace users, but also bands and celebrities. One of the reasons why this is pretty imperative for MySpace is because it's in serious danger of losing out entirely to Facebook's "fan pages." MySpace gained much of its early traction because it was possible for independent musicians to establish a presence and manage a fan base there, something that lost its luster once Facebook's open-ended fan pages started to take off even more successfully than many had speculated. 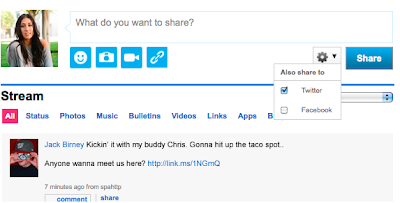 "This is particularly exciting for the millions of musicians on MySpace who can now use this tool as a complement to their MySpace Music presence and share their vast library of content, including full album catalogs, to people who've liked their Facebook page," a release from MySpace explained.